We are delighted to announce that, in conjunction with New Hope, we will be hosting a question and answer sessions with Iain Tulley, who is Chief Executive of the AWP. Come and ask the questions you have always wanted to ask. When: 13th May 2014 from 7.00 – 9.00 P.M.
As spaces will be limited, you will need to register below in order to attend. If you cannot attend but would like us to ask a question on your behalf, please complete the form below. Please note that although we will make every attempt to ask as many questions as possible, time restrictions mean that we can not guarantee to ask all submitted questions. As you are aware, Keep Safe Keep Sane have done a lot of work with carers to write a Carers’ Charter, which represents what carers feel they need to help them care for their loved ones. 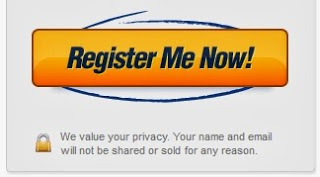 A link to the charter is in the main menu at the top of the page on our web site. This charter is to be displayed and made available to all carers. 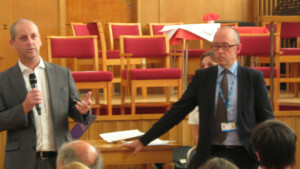 It is designed to be monitored and also to allow the carer to challenge staff if it is not being adhered to. I would like to thank all carers who provided input into this charter and the workshop we ran. I would also like to thank the AWP for giving carers an opportunity to truly input into their services. A group of KS2 members met up with Andrea Moorland (Commissioner for mental health services in BANES), to talk about the Well Being College starting in BANES. Lots of different courses will be run for people for long term medical conditions and for carers. It will be an exciting opportunity for BANES, and the pilot scheme will run for 2 years. If it is a success it will change the way that mental health and other conditions are supported, and it will also include carers! Many thanks to Andrea for talking to us, and also for donating £50 to Keep Safe Keep Sane. Many thanks for turning out on what was a horrible, cold evening. After finding ourselves locked out of the buidling, we re-convened at M’s house. Many thanks to her for bailing us out. We had two really good talks, one from Paul Hudson from St Mungos about crisis housing in Bristol (please could we get this housing in Bath! ), and one from David from Lift, about the therapies they offer. We are hoping to get some workshops with Lift specifically for carers, so watch this space. We also had coffee and cakes from T and everyone had a good chat. 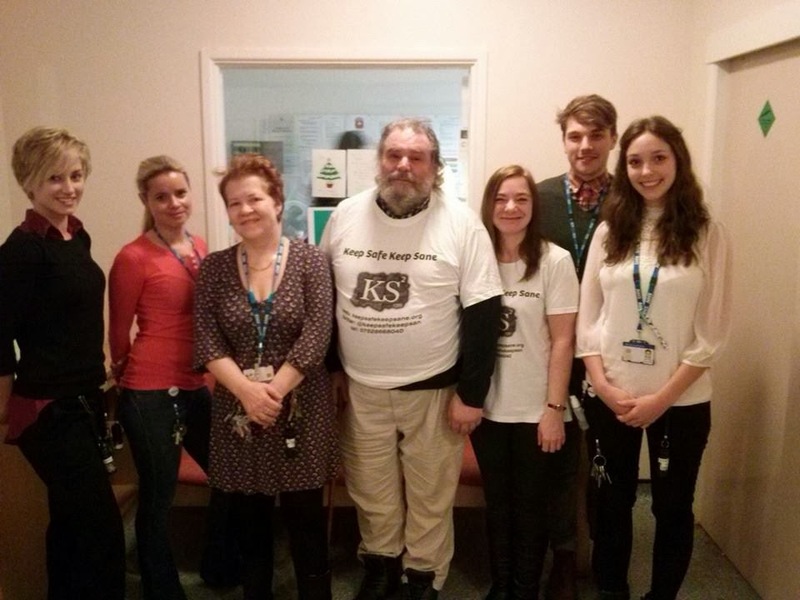 Members of Keep Safe Keep Sane met with the AWP to write up a new Trust-wide carers’ charter. Many of you on our mailing list have now received this. The Charter has one last step to go through, this being ratification by the AWP board. When this is completed it will be publicised. Keep Safe Keep Sane will be working with the AWP to ensure the Charter is implemented. We will post it up on this blog when it is finished. 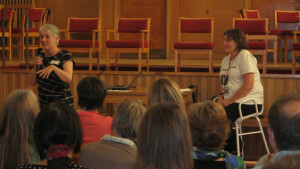 We had a good turnout of carers to meet Gina Smith from the AWP to talk about psychosis and family work. We had a lively an interesting discussion. Many thanks Gina for coming to talk to us. Gina has expressed an interest in working with our group by offering advice and supporting carers. We are in discussions with the AWP about this and will keep you posted. Soundwell’s dedicated team of music therapists provides a community based music therapy service in Wiltshire, B&NES and Somerset for people with severe mental health needs and those experiencing emotional or mental distress (including personality disorders). sessions will include some reflecting on your learning. to help in the caring role. or friends who would not be able to manage without their support. those of others around them and will include a relaxation session. 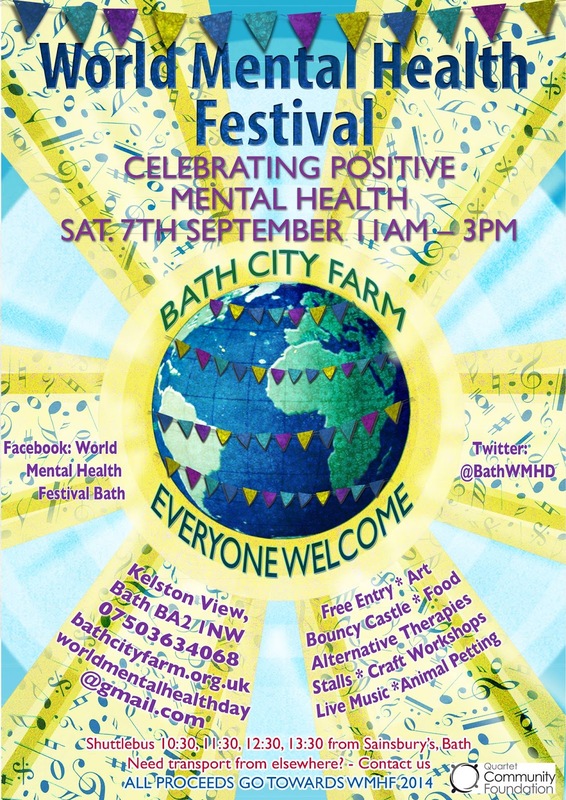 Fresh Art @ Hillview is looking for original artwork created by artists with experience of mental health issues in the B&NES area for display in the Sycamore Ward at Hillview’s acute psychiatric unit, Royal United Hospital in Bath. Fresh Art @ Hillview is a six month project that will run until the end of June 2014 in which Hillview residents and community groups in B&NES are encouraged to create pieces of artwork that will be displayed within Sycamore Ward at Hillview acute psychiatric unit, Royal United Hospital. The artwork will be rotated every few months within 3 social rooms at Hillview replacing the old faded pictures/reproductions with ‘fresh art’ that have been created locally. Fresh artwork will improve the environment for residents and staff at Hillview and will be conversational, thought provoking and inspirational. It is hoped that this venture will develop into other opportunities for exhibiting at other venues and events in B&NES. For the first exhibition (Feb-April) we would like to invite artists already developing work, as part of their community groups in Bath, to submit 1-3 pieces for consideration in a ‘People’s Choice’ at Hillview in early February, when in-patients and staff at Hillview will choose the pieces they would most like to display. If your piece is not selected first time round we hope you will resubmit for the second and third displays. The selected pieces will be framed and hung in the ward for 2-3 months. The deadline for the first display is January 31st – so get in quick! Keep Safe Keep Sane members Eddie (who took the picture), Tanya and Duncan taking chocolates for the patients at Hill View Lodge in Bath over the Christmas period. Many thanks to the staff for the warm welcome! The next KS2 meeting will be on 14th January 2014. Keep Safe Keep Sane would like to wish you all a merry Christmas and a very happy New Year!! We have been informed that the meeting to finalise the Carers’ Charter has been postponed. There have been a few issues which we are hoping will be sorted out. We will let you know what happens. This was a joint meeting with Think Tank. This was our Christmas meeting, and Jo from PALS attended and did an interesting and informative talk with lots of interaction. Afterwards we had a get together with good food, Christmas songs, and a great time was had by all! We chaired a workshop to collect data from carers to go on the Carers’ Charter for the AWP. We were disappointed that were not that many carers there – eleven altogether – as we were limited to 5 carers from each area of the Trust. I do think that this shows that the engagement with carers and the AWP outside of Bath is not very good. We successfully chaired a meeting of professionals and carers and collected a lot of good information to go on to a carers’ charter. We are going to have a small meeting to write up this charter, so watch this space. Members of the AWP coming to our meetings to give talks etc. All the members of the committee were re-elected. Ralph Lillywhite did a talk about St Mungos, New Hope and The Hope Guide – a booklet containing all the groups and activities in BANES. We had a really good meeting with some coffee and a chat after the talk. We have written our own Carers’ Charter, that has been written by carers. We read the proposed charter from the AWP and we didn’t think it represented carers’ views. Our group approached the AWP and got permission from the chair of the AWP to do a charter workshop to put together an AWP trust-wide carers’ charter. This workshop is on November 22nd 2013. We have written our annual report, a copy of which is here. 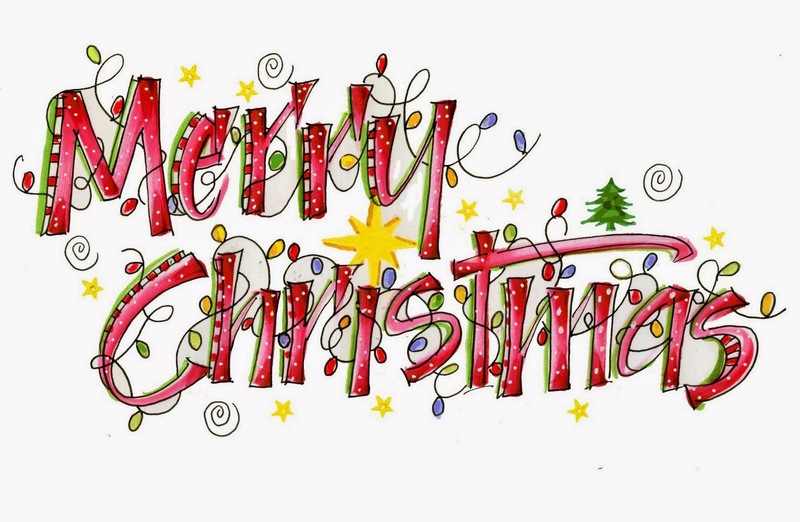 Correction – date for next meeting and Christmas party! The date for the next meeting and the Christmas party was wrongly put as 2nd December in an earlier post. It is in fact on the 10th of December!!! I’m sure most of you would have twigged this as we always meet on the 2nd Tuesday of each month, but in case you didn’t I’m really sorry! The proof reader has been fired!! 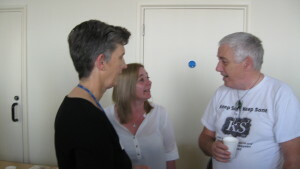 The “What Works” conference was really good event that was well attended by professionals, service users and carers. There were a lot of frank discussions and a variety of views. 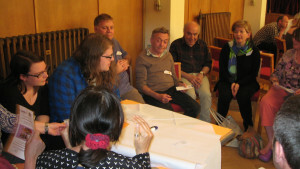 We did a workshop about our Carers’ Charter and got a lot of really good feedback. The occasion was a great success, and I really hope it becomes an annual event. Present: D, E, B, T, M, L, J, T and L.
Many thanks to Tom Fox-Proverbs (BANES Carers’ Centre) and Lee Rawlings (AWP Service User & Carer Involvement Officer) for doing talks at our first meeting at the new venue. 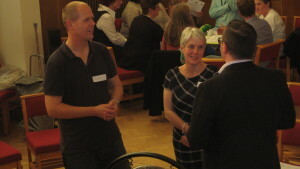 A big welcom also to all the new members who attended. This was a lively meeting with lots of discussion, and some lovely cakes thanks to T.
The lady who runs the Minerva Centre in Bath (http://www.minervacentrebath.co.uk/) will be coming to out next meeting, so that should be very interesting. We will be running a stall at the Creativity Works Fete on 2nd November at Victoria Hall, Radstock. Please come along for a lovely family day out. We would like to have a “Splat The Rat” game on our stall, so any help to make it would be very welcome! Our next meeting is our AGM on 19th November 2013 at the new Carers’ Centre in Bath (address below). 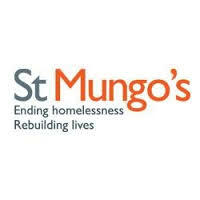 We will also be having a talk from Ralph Lilywhite from St Mungos and New Hope. 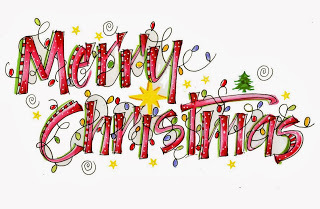 On the 2nd December, the Patient Advice and Liaison Service (PALS) from the AWP (http://www.awp.nhs.uk/advice-support/pals/) will be coming to do a talk, and this will be followed by our Christmas party!! Please do come along! On the 25th September we met with Lu Duhig from the AWP. Lu is the Trustwide Carer Engagement Officer for the AWP. At the meeting we discussed both the AWP’s and our Carers’ Charter. As a group, we felt that their Carers’ Charter was too vague, and didn’t have sufficient input from carers. Lu Duhig said that as there were concerns over their charter, it would be put on hold. As a result, we will be meeting with the AWP non-executive director Tony Gallagher with the intention of providing more carer input into their charter. We now have a Paypal “Donate” button on our website! We are a constituted group without any regular funding. If you would like to make a donation to help keep this peer support group running, please follow the link. Every donation helps, no matter how small. 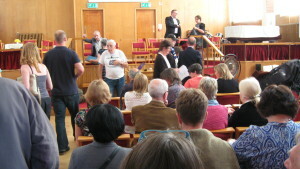 We attended the AWP Celebrations in Bath last Friday, and we gave out leaflets and copies of our Carers’ Charter. It was a very useful day. We are now awaiting an invitation to present the charter to the AWP board members. Thanks to all who attended what was a really good meeting. Keep Safe Keep Sane meetings will be moving to a new location. The BANES Carers’ Centre are opening a new office in Bath, and they have kindly allowed us to use a room for our meetings. B, D and E are to meet Tom Fox-Proverbs to look over the new venue. We are also going to be changing the format of our meetings. In the future we will have committee meetings separate to the Tuesday night KSKS meetings, and the KSKS meetings will have a guest speaker for one half, and the other half will be set aside for talking and refreshments. We have made a leaflet advertising our group which can now be distributed. We have also written a Carers’ Charter and we need everyone involved with KSKS to read the final document. We feel strongly that this is a unique document, and it needs to discussed with the AWP as it expresses carers’ concerns. We would like everyone to read it and give us your feedback. You can also sign our petition here. 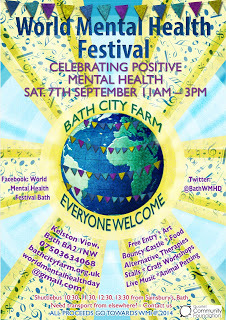 Many thanks to all who helped at the World Mental Health Festival. It was a great success! Splat the Rat was very popular and we had a lot of interest in our group. We managed to give out some of our new leaflets too. Keep Safe Keep Sane has been writing its own Carers’ Charter. We have been talking to a lot of carers to generate a charter that represents what carers want and need. We want as many carers as possible to read this charter and we have started a petition that we would like everyone to sign who agrees that it should be part of AWP policies and procedures. The link to the petition is here. Please take a few moments to read the charter and (if you agree) sign the petition. The World Mental Health Summer Festival is taking place at Bath City Farm, and we have a stall there! There is lots going on, from fete stalls to workshops and live music. It’s from 11.00 A.M. till 3.00 P.M.so come along for a really great day!! 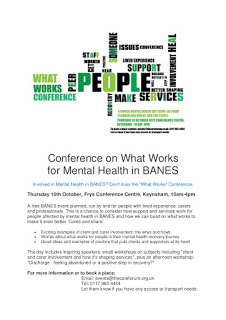 St Mungos are holding their What Works Conference at Fry’s Conference Centre in Keynsham. 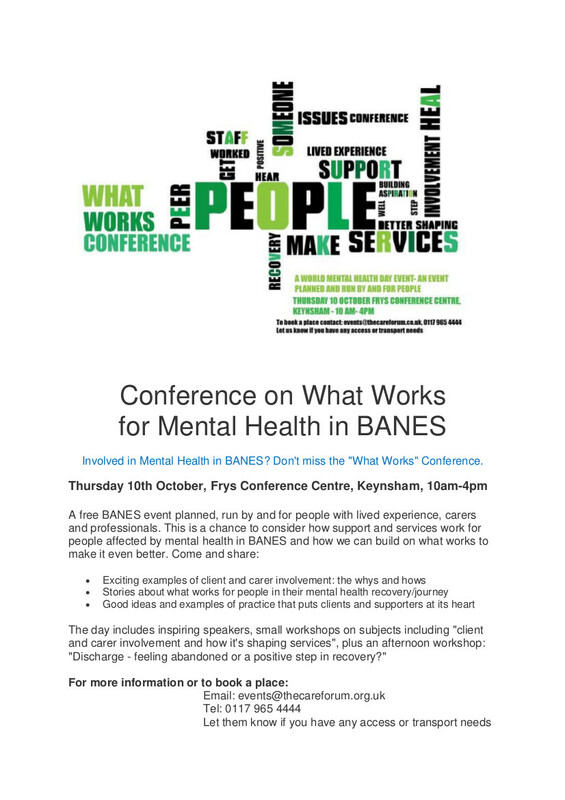 They will be discussing with mental health professionals, service users and carers what is working and what could be improved upon and how.